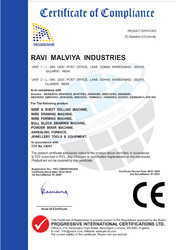 We "Ravi Malviya Industries" are engaged in manufacturing, trading and exporting a high-quality assortment of JEWELLERY WIRE DRAWING MACHINE, WIRE & SHEET ROLLING MACHINE, ANNEALING MACHINE, JEWELLERY BULL BLOCK MACHINE, WIRE FORMING MACHINE, GOLD CHAIN POWDER MIXTURE, GOLD TUBE FORMING MACHINE, GOLD DRAW BENCH MACHINE, PIPE ANNEALING MACHINE & OTHER VARIOUS JEWELLERY TOOLS & EQUIPMENT . We are a Sole Proprietorship company that is established in the year 1998 at Ahmedabad, Gujarat and are connected with the renowned vendors of the market who assist us to provide a qualitative range of products as per the global set standards. 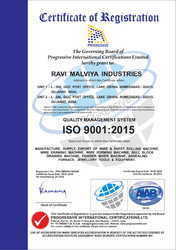 Under the supervision of "Mr. Ravi Malviya", we have attained a dynamic position in this sector. Our team includes highly skilled and experienced team of professionals who assist us in manufacturing and supplying the best quality machines in accordance with international quality standards. Our professionals are highly experienced and knowledgeable in meeting the variegated needs and wants of our precious clients. We have recruited these professionals on the basis of their academic records and expertise in their respective domains. In order to keep them updated with the latest market developments, we regularly conduct various training sessions, seminars and workshops. Our sophisticated infrastructure is the main asset of our organization which assists us in establishing a glorious position in the industry. Our infrastructure base comprises of varied specialized units such as procurement, manufacturing, quality control, sales & marketing, etc. Our manufacturing unit is armed with advanced machinery and latest technology that enable us to fulfill large scale, immediate and customized orders of our clients in the most efficient & economical manner. Our experienced professionals provide us an excellent array of machines that are unmatched in terms of quality and durability. We have one of the largest manufacturing units of these products in India and are acclaimed for quality of our products. Our products are manufactured using premium quality. The diversified clientele around the world is the proof of quality and satisfactory products.